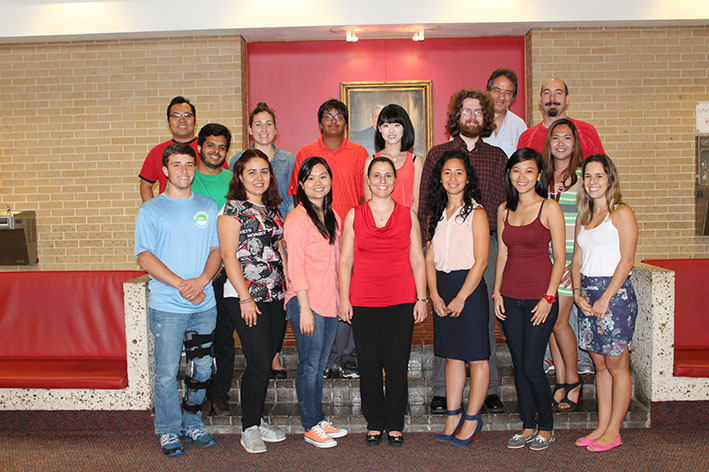 2016- Present: Associate Professor, Department of Civil and Environmental Engineering, Cullen College of Engineering, University of Houston, Houston, Texas. 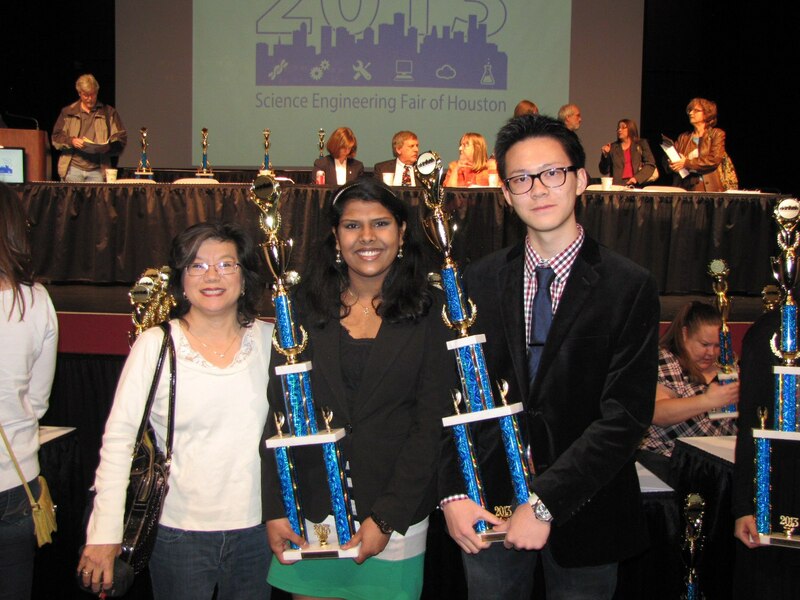 2010-2016: Assistant Professor, Department of Civil and Environmental Engineering, Cullen College of Engineering, University of Houston, Houston, Texas. 2000-2002: University of São Paulo, São Paulo, Brazil, Microbiology Department, Masters Degree, Graduate Research Assistant; Advisor: Dr. Vivian Helena Pellizari. Thesis title: Polyphasic characterization of xenobiotic pollutant-degrading bacteria diversity in Santos Estuary. The central topic of my research interest is water quality and sustainability. My research is divided in three main topics: (i) better understanding of the aquatic system and its microbial ecology; (ii) investigation of the effects of nanomaterials on the environment (more specifically, carbon-based nanomaterials) through application of molecular biology and nanotoxicological tools, and; (iii) development of new nanotechonologies and biotechnologies to keep the aquatic system safe and remove unwanted contaminants. Rodrigues, D.F. “Nanocomposite hydrogel polymer beads for water purification”. US Patent App. 62/009,060, 2014. Rodrigues, D.F. ; Advincula, R.; Claydon, F.; Santos, C.; Tria, M.C. “Nanocomposite PVK-graphene based nanomaterial filters for the simultaneous removal of bacteria and heavy metal”. WO Patent 2,013,039,895, 2013. Rodrigues, D.F. ; Advincula, R.; Claydon, F.; Santos, C.; Tria, M.C. “Nanocomposite polymer-carbon based nanomaterial filters for the simultaneous removal of bacteria and heavy metals”. US Patent App. 13/609,179, 2012. J. Peña-Bahamonde, V. San Miguel, J.C. Cabanelas, D.F. Rodrigues. Biodegradation and stability effect in PSU nanocomposites adding rGO nanosheets. Pannano-2017. Guarujá, Brasil. Nov, 2017. Bandara, P.C., Nadres, E., Rodrigues, D. F., Development of Multifunctional Nanocomposite Coating for Indirect Potable Reuse Water Treatment, 6th Sustainable Nanotechnology Organization Conference in Los Angeles, November 2017. Bandara, P.C., Nadres, E., Rodrigues, D. F., Development of Multifunctional Nanocomposite Coating for Indirect Potable Reuse Water Treatment, 3rd Graduate Research and Scholarship Projects Day in Houston, November 2017. Bandara, P.C., Nadres, E., Rodrigues, D. F., Development of Multifunctional Nanocomposite Coating for Indirect Potable Reuse Water Treatment, 1st PanNano conference in Sao Paulo, November 2017. Ansari, A., Cao, B., Yi, X., Hu, Y. & Rodrigues, D. F., Investigating the effect of graphene oxide on scaling in thin-film composite polyamide reverse osmosis membrane, 6th Sustainable Nano Organization Conference in Los Angeles, November 2017. Rodrigues, D.F. ; “Chitosan-based Polyethyleneimine Graphene Oxide Nanocomposite Beads for Heavy Metal Treatment of Electroplating Wastewater”. IWA Nano & Water Specialist Conference: Addressing the Water-Energy-Food Nexus, May 16-18, 2016 (invited talk). Nguyen, H. N. & Rodrigues, D. F., Acute Toxicity of Graphene to Activated Sludge, Texas water at student forum in Fort Worth, April 2016. Nguyen, H. N. & Rodrigues, D. F., Acute Toxicity of Graphene to Activated Sludge, International Conference on Environmental Science and Technology in Houston, June 2016. Nadres, E. T.; Rodrigues, D. F. “Simultaneous nitrate and phosphate removal from drinking water using immobilized polyethyleneimine” 8th International Conference on Evironmental Science and Technology, Houston, TS, United States, June 6-10, 2016 (2016). Perez, J.V; Dalida, M.L.P. ; Rodrigues, D. F. Optimized Synthesis of Polymer-based Graphene Oxide Nanocomposites for Heavy Metal Adsorption using Response Surface Methodology. 8th International Conference on Evironmental Science and Technology, Houston, TS, United States, June 6-10, 2016 (2016). GM Santos, FI de Santi Ferrara, F Zhao, DF Rodrigues, WC Shih. Photothermal inactivation of bacteria on plasmonic nanostructures. Proc. SPIE 9724, Plasmonics in Biology and Medicine XIII, 97240D (April 22, 2016); doi:10.1117/12.2213191. Rodrigues, D.F. Environmental impact of carbon-based nanomaterials released during nanocomposite biodegradation. U.S. Air Force. Dalton, OH. Jan 28th 2016 (invited talk). Rodrigues, D.F. Impact of Nanomaterials on Environmental Microbial Communities: perspectives for Future applications Texas A&M University-Kingsville. October 7th 2015 (invited talk). Rodrigues, D.F. & Mejias, I.E.C. Copper removal by bioadsorption: A biotechnology approach. 249th ACS National Meeting, Denver, CO, March 22-26, 2015. Nguyen, H. N. & Rodrigues, D. F., Acute Toxicity of Graphene to Activated Sludge, Gordon Research Seminar: Environmental Nanotechnology, West Dover, VT, June 20-21, 2015. 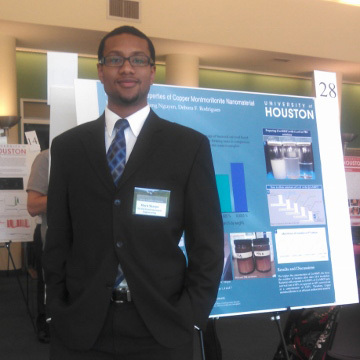 Nguyen, H. N. & Rodrigues, D. F., Acute Toxicity of Graphene to Activated Sludge, Graduate Research and Scholarship Projects Day, University of Houston, Houston, TX, October 30rd, 2015. Nguyen, H. N. & Rodrigues, D. F., Acute Toxicity of Graphene to Activated Sludge, Fourth Annual Conference of Sustainable Nanotechnology Organization, Portland, OR, November 8-10, 2015. TJ Cutright; LN Williams; LT Coats; DF Rodrigues; JE Puskas; FJ Claydon. Easing the Tortuous Road that Under-represented Minorities take to Be Engineering Faculty. 122nd ASEE Annual Conference & Exposition, June 14-17, 2015. Seatle, WA. Paper ID#: 11279. RP Medina, FC Ballesteros, DF Rodrigues. 2015. The influence of physical configuration in the performance of chitosan–poly(acrylic acid) hydrogel beads as adsorbent. 14th International Conference on Environmental Science and Technology. Rhodes, Greece. Paper ID#: cest2015_00688. CD Grande T., J Mangadlao, B Tiu, AD León, F Jingjing, DF Rodrigues and RC Advincula. 2014. Chitosan/graphene oxide nanocomposite membranes with antimicrobial activity. XIV SLAP/XII CIP 2014, October 12-16th, 2014, Porto de Galinhas, Brazil. Paper ID#: O3-8. LV Monsalve, J Mangadlao, RC Advincula, F Jingling, DF Rodrigues, M Valencia, CD Grande 2014. Evaluation of chitosan films supplemented with essentials oils of Colombian oregano (Origanum vulgare L.) and rosemary (Rosmarinus officinalis) plants as antimicrobial and antioxidant agents. XIV SLAP/XII CIP 2014, October 12-16th, 2014, Porto de Galinhas, Brazil. Paper ID#: O4-20. Fan, J.; Rodrigues, D.F. Photocatalytic Antimicrobial Properties of 1T-MoS2 and 2H-MoS2 in the presence of electron donor and visible light. 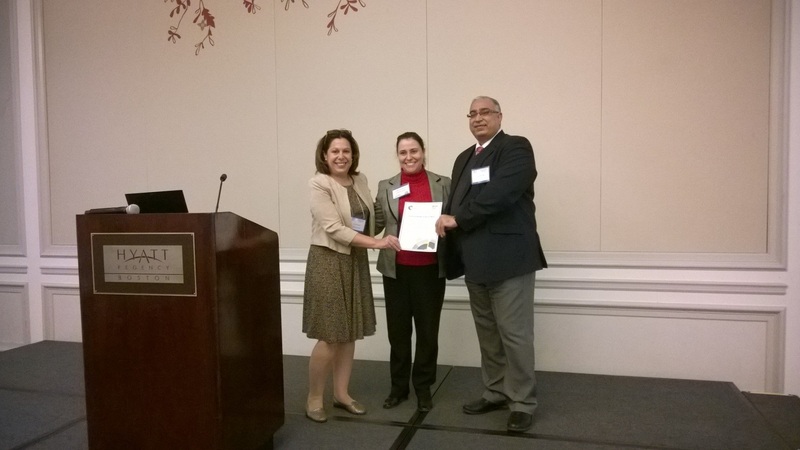 Sustainable Nanotechnology Organization (SNO).Boston, MA, Nov. 2-4, 2014. Rodrigues, D. F., Mejias, I.C. Graphene oxide functionalized with ethylenediamine triacetic acid for heavy metal adsorption and anti-microbial applications. Sustainable Nanotechnology Organization (SNO). Boston, MA, Nov. 2-4, 2014. 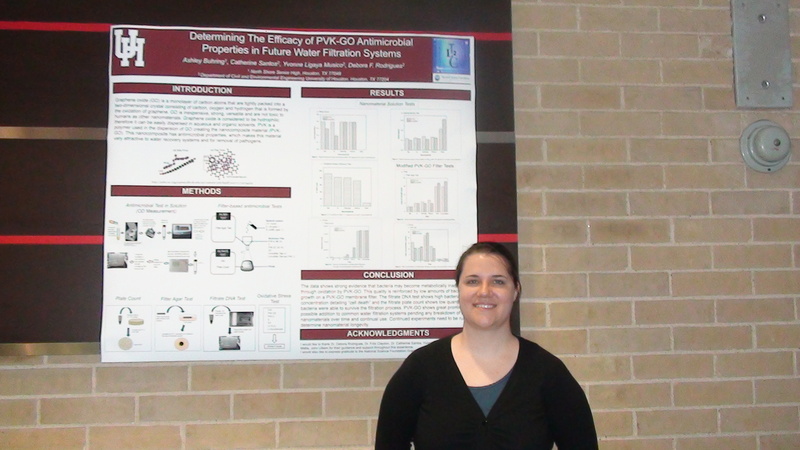 Rodrigues, D.F., Environmental Applications of graphene oxide nanocomposites on surfaces. Sustainable Nanotechnology Organization (SNO). Santa Barbara, CA, Nov. 2-5, 2013. Ahmed, F. and Rodrigues, D.F. The Impact of Graphene Oxide on aquatic biogeochemical cycle, World Environmental and Water Resource Congress, Cincinnati, Ohio, May 19-23, 2013. Ahmed, F. and Rodrigues, D.F., Investigation of acute effects of graphene oxide on wasterwater microbial community: A Case Study, Gordon Research Conference on Environmental Nanotechnology, Stowe, Vermont, June 2-7, 2013. Onal Okyay, T.; Rodrigues, D. F., Microbial calcium carbonate precipitation and its contribution to the environment. University Forum at Texas Water 2013, WEAT and Texas Section AWWA Annual Conference, April 9-12, 2013, Galveston, TX. Ahmed, F.; Rodrigues, D.F. Investigation of acute toxicity of Graphene Oxide on wastewater microbial communities and related short term effects on wastewater treatment process performance: a case study on Sims South Bayou wastewater treatment plant, Houston, Texas . University Forum of Texas Water Exhibition , April 09-12, 2013, Galveston, Tx. Onal Okyay, T.; Rodrigues, D. F., Application of response surface methodology for the optimized precipitation of calcium carbonate using Sporosarcina pasteurii. Annual Fall Meeting of the Texas Branch of the American Society for Microbiology, October 18-20, 2012, Waco, TX. Rodrigues, D.F; Ahmed, F.; Santos, C.M. PVK-SWNT and PVK-MWNT coated stainless steel for prevention of microbial growth and corrosion. ASME 2012, November 15th, 2012. Houston, TX. Carpio, I.E., C.M. Santos, R.C. Advincula, D.F.Rodrigues. Environmental Engineering applications of graphene oxide nanomaterials: 243rd ACS National Meeting & Exposition, March 25-29th, 2012. San Diego, CA. Rodrigues, D. F. Environmental Engineering applications of carbon-based nanomaterials. University of Texas San Antonio, April 6th 2012, San Antonio, TX. Ahmed, F.; Santos, C.M. ; Advincula, R.; Rodrigues, D.F. Protection of Stainless Steel Surfaces Against Biofilm Formation and Corrosion by Nanocomposite Coatings. 6th International Conference on Environmental Science and Technology, June 25-29, 2012, Houston, TX. Ahmed, F., D.F. Rodrigues. Application of Electroactive PVK-SWNT Nanocomposite as Effective Antimicrobial Coating Material for Membrane Filter. Texas Water, April 10-13th 2012, San Antonio, TX. Claydon, F.; Long, S.; Rodrigues, D.F. 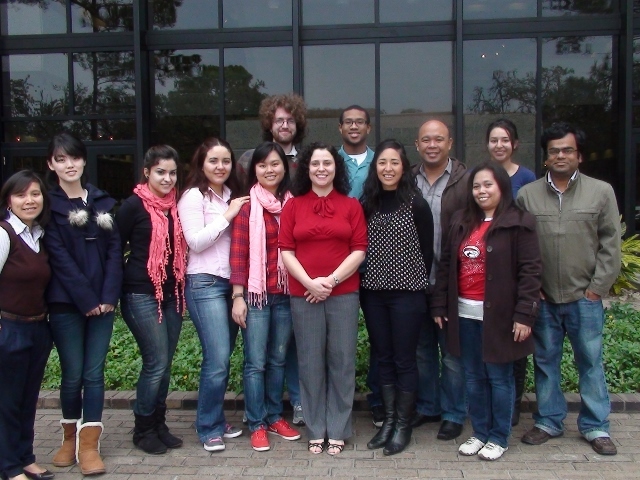 Research Experience for Teachers (RET) site at the University of Houston (UH) “ Innovations in Nanotechnology”. National Science Foundation Engineering Education Awardees Conference, March 4-6th, 2012. Arlington, Virginia. Santos, C.M., R.C. Advincula, D.F. Rodrigues. Fabrication and antibacterial applications of carbon nanomaterial containing polymer based nanocomposites: 243rd ACS National Meeting & Exposition, March 25-29th 2012, San Diego, CA. Borba, T. R., S. K. Sakata, R.V.P. Ferreira, M. H. Bellini, D. F. Rodrigues, J. T. Marumo. Application of Bacteria to Remove Americium from Radioactive Liquid Waste: WM2011 Conference, February 27 - March 3, 2011, Phoenix, AZ. Rodrigues, D.F., 2010. Microbial Interactions with Carbon nanotubes: from single cells to biofilms. In: University of Houston, Houston, July 23th. (Invited talk for the UH-AGEP program). Rodrigues, D. F., 2009.Microbial Interactions with Carbon nanotubes: from single cells to biofilms. In: University of Texas, San Antonio, March 19th. (Invited talk). Rodrigues, D. F., 2009.Microbial Interactions with Carbon nanotubes: from single cells to biofilms. In: University of Delaware, March 11th. (Invited talk). Rodrigues, D. F., 2009. Biogeography, Diversity, and Physiology of Extreme Microbes. In: Southern Illinois University, Carbondale, January 29th. (Invited talk). Rodrigues, D.F., 2009. Microbial Interactions with Carbon nanotubes: from single cells to biofilms. In: University of California, Los Angeles, January 27th. (Invited talk). Rodrigues, D. F., Elimelech, M. 2008. Influence of D-mannose on Biofilm Formation. In: Gordon Research Conference on Environmental Sciences: Water, Holderness, NH, June 22-27. Rodrigues, D.F., Elimelech, M. 2008. Influence of Carbon Source on Biofilm Formation. In: 235th ACS meeting, New Orleans, April 10th. Rodrigues, D.F., H.L. Ayala-del-Río, D. Gilichinsky, V.H. Pellizari, E.C. Jesus, L. Sepulveda-Torres, J.M. Tiedje. 2007. Is the Bass-Becking Hypothesis true: “The Environment Selects and is Responsible for Spatial Variation in Microbial Diversity?”. Amer. Soc. Microbiol. General Meeting, Toronto, Canada. # N-026. Rodrigues, D. F., Ivanova, N. & Tiedje, J.M. 2006. Metabolism inference from the genome of Exiguobacterium sibiricum sp. isolated from the Siberian permafrost [Abstract]. Amer. Soc. Microbiol. General Meeting, Orlando, FL. # K-080. Rodrigues, D.F., H.L. Ayala-del-Río,C.-J. Lin, D.Gilichinsky, J.M. Tiedje. 2006. Detection and Quantification in the Siberian permafrost of Exiguobacterium sp. and Psychrobacter sp. through quantitative real-time PCR. In: International Conference on Alpine and Polar Microbiology, Innsbruck, Austria, March 27-31. Rodrigues, D.F., C.J. Lin, N.K. Rehman, D. Gilichinsky, J.M. Tiedje. 2005. Exiguobacterium spp. abundance in the Siberian permafrost. Abstract 39. In: The Joint International Symposia for Subsurface Microbiology (ISSM 2005) and Environmental Biochemistry (ISEB XVII), Jackson Hole, WY, Aug. 14-19. Vishnivetskaya, T. A., R. Ramaley, D. F. Rodrigues, J. M. Tiedje, and S. Kathariou. 2005. Exiguobacterium from frozen subsurface sediments (Siberian Permafrost) and other sources have growth temperature ranges reflective of the environmental thermocline of their origin. Abstract 254. In: The Joint International Symposia for Subsurface Microbiology (ISSM 2005) and Environmental Biogeochemistry (ISEB XVII), Jackson Hole, WY, August 14-19. Rodrigues, D.F., J. Goris, M.F. Thomashow, J.M. Tiedje. 2005. Phylogeny of three Exiguobacterium isolates from Arctic permafrost. Astrobiology 5:264. Gilmour J.S., D. Rodrigues, J.M. Tiedje, D.M. Lubman, M.F. Thomashow. 2002. Changes in Gene Expression in Response to low temperature in two Psychrobacter isolates from Arctic Permafrost. Astrobiology 2: 549. Rodrigues, D.F., A. C. Lopez, G.T. Yogui, R.C. Montone, M. Bícego, G. Manfio, V.H. Pellizari. 2001. Isolation and characterization of hydrocarbons and polychlorinated biphenyl bacterial consortia from Santos Estuary. In: XXI Brazilian Conference in microbiology. Foz do Iguaçu, RS, Brazil. Gilson, P.M., V.H. Pellizari, V.M. de Oliveira, R.F. Vazoller, A. Conationi, D.F. Rodrigues, G. Bellincanta, F.F. Piza, C. R. Nakayama, F. Talarico. 2000. Diversity of aerobic organochlorine-degrading bacteria in nature. In:I Biota/FAPESP program symposia. São Paulo, Brazil. Rodrigues, D.F., B.A. Matos, A. Pacheco, V.H. Pellizari. 2000. Transport and retention of coliphage T4 in soil Columns from a Cemetery in São Paulo, Brazil. In: International Water Association Health - Related Water Microbiology Symposium. Paris, France. July 3-7. Rodrigues, D.F., G.B.Ghion, A.Rubin, R.Montone, R.R.Weber, V.H.Pellizari. 1999. Rodrigues, D. F. Characterization and degradation ability of bacteria isolated from Antarctica. In: The Joint 1o International Scientific Initiation Symposia and 7o Scientific Initiation of University of São Paulo, Brazil. Rodrigues, D.F., M.R. Passos-Bueno. 1996. Leporine lips and cleft palates gene association in the Brazilian population. In: 4o Scientific Initiation of University of São Paulo, Brazil. Environmental Science and Technology, Applied and Environmental Microbiology, FEMS Microbiology Letter, FEMS Microbiology Ecology, Journal of Biotechnology, Antarctic Science, Current Microbiology, Journal of Basic Microbiology, Global Research Journal of Microbiology, Biofouling, Extremophiles, Open Forensic Science Journal, Journal of Environmental Informatics, RSC Advances, Soft Matter, Colloids and Surfaces B: Biointerfaces, Analytical Methods, Journal of Zhejiang University Science B, International Journal of Ambient Energy, nanoscale, Langmuir, Toxicology Research, ACS nano, Journal of Materials Chemistry, Analyst, Journal of Hazardous materials, Carbon, Analytical Chemistry, Water Research, ACS Applied Materials & Interfaces, Chemical Engineering Journal, Science of the Total Environment, polymers, metallomics, Applied Microbiology and Biotechnology, International Biodeterioration & Biodegradation, Environmental Science and Pollution Research, chemosphere, BMC Genomics, Bioresource Technology, Water, Air, & Soil Pollution, Analytical Methods, Environmental Engineering Science, Water Environment Research, Environmental Chemistry Letters, ES&T Letters, PLOS ONE, Applied Surface Science, Ecological Engineering, ACS Sustainable Chemistry & Engineering, Industrial & Engineering Chemistry Research, Ecotoxicology and Environmental Safety, Journal of Microbiological Methods, Materials Research Bulletin. Nguyen, H.N. ; Rodrigues, D.F. Chronic toxicity of graphene and graphene oxide in sequencing batch bioreactors: A comparative investigation. 2018. Journal of Hazardous Materials. 343, 200-207. McLay, R.B. ; Nguyen, H.N. ; Jaimes-Lizcano, Y.A. ; Dewangan, N.K. ; Alexandrova, S.; Rodrigues, D.F. ; Cirino, P.C. ; Conrad, J.C. Level of fimbriation alters the adhesion of Escherichia coli bacteria to interfaces. 2017. Langmuir. DOI: 10.1021/acs.langmuir.7b02447v. Tiu, B.D.B. ; Nguyen, H.N. ; Rodrigues, D.F. ; Advincula, R.C. Electrospinning Superhydrophobic and Antibacterial PS/MWNT Nanofibers onto Multilayer Gas Barrier Films. 2017. Macromol Symp. 374 (1). 1600138. doi:10.1002/masy.201600138. Fan, J.; Grande, C.D. ; Rodrigues, D.F. Biodegradation of graphene oxide-polymer nanocomposite films in wastewater. 2017. Environmental Science: Nano. DOI: 10.1039/C7EN00396J. Nadres, ET; Perez, JVD; Rodrigues, DF. High-capacity hydrogel polymer composite adsorbent for nitrate and phosphate removal from water. 2018. Proceedings of the Water Environment Federation 2017 (3), 438-460. Oliveira, R.C. Davenport, K.W. ; Hovde, B.’; Silva, D.; Chain, P.S.G. ; Correa, B.; Rodrigues, D. F.; Draft Genome Sequence of Sorghum Grain Mold Fungus Epicoccum sorghinum, a Producer of Tenuazonic Acid. 2017. Genome announcements 5 (4), e01495-16. Perez, J.V.D. ; Nadres, E.T. ; Nguyen, H.N. ; Dalida, M.L.P. ; Rodrigues, D.F. ; Response surface methodology as a powerful tool to optimize the synthesis of polymer-based graphene oxide nanocomposites for simultaneous removal of cationic and anionic heavy metal contaminants. 2017. RSC Advances 7 (30), 18480-18490. Peña-Bahamondea, J.; Miguel, V.S. ; Nguyen, H.N. ; Ozisik, R.; Rodrigues, D.F. ; Cabanelas, J.C. Functionalization of reduced graphene oxide with polysulfone brushes enhance antibacterial properties and reduce human cytotoxicity. 2017. Carbon. Volume 111, January 2017, Pages 258–268. Okyay, T.O. ; Nguyen, H.N. ; Castro, S.L. ; Rodrigues, D.F. CO2 sequestration by ureolytic microbial consortia through microbially-induced calcite precipitation. 2016. Science of The Total Environment, 572, 671-680. Medina, R.; Nadres, E.T. ; Florencio Jr, B.; Rodrigues, D.F. Incorporation of Graphene oxide into Chitosan-Poly (acrylic acid) porous polymer nanocomposite for enhanced lead adsorption. 2016. Environmental Science: Nano (3), 638-646. DOI: 10.1039/C6EN00021E. Carpio, I. E M.; Franco, D.C.; Sato, M.I.Z. ; Sakata, S.; Pellizari, V.H. ; Filho, S.S.F. ; Rodrigues, D.F. Biostimulation of metal-resistant microbial consortium to remove zinc from contaminated environments. 2016. Sci Total Env. V.550, 670-675. Santos, GM; de Santi Ferrara, FI; Zhao, F.; Rodrigues, DF; Shih, W.C. Photothermal inactivation of heat-resistant bacteria on nanoporous gold disk arrays.2016. Optical Materials Express 6 (4), 1217-1229. Fan, J.; Li, Y.; Nguyen, H.N. ; Yao, Y.; Rodrigues, D.F. Toxicity of exfoliated-MoS2 and annealed exfoliated-MoS2 towards planktonic cells, biofilms, and mammalian cells in the presence of electron donor. 2015. Environmental Science: Nano 2 (4), 370-379. Smith, S.C.; Rodrigues, D.F. Carbon-Based Nanomaterials for Removal of Chemical and Biological Contaminants from Water: A Review of Mechanisms and Applications. 2015. Carbon. doi:10.1016/j.carbon.2015.04.043. Onal, T.O. ; Rodrigues, D.F. Biotic and abiotic effects on CO2 sequestration during microbially-induced calcium carbonate precipitation. 2015. FEMS Microbiology Ecology. doi: 10.1093/femsec/fiv017. J. D. Mangadlao, C. M. Santos, M. J. L. Felipe, A. C. C. de Leon, D. F. Rodrigues and R. C. Advincula. On the antibacterial mechanism of graphene oxide (GO) Langmuir–Blodgett films. 2015. Chem. Commun. DOI: 10.1039/C4CC07836E. Onal, T.O. ; Bala, R.K.; Nguyen, H.N; Atalay, R.; Bayam, Y.; Rodrigues, D.F. Antibacterial Properties and Mechanisms of Toxicity of Sonochemically Grown ZnO Nanorods. 2015. RSC Advances. V. 5 (4), p. 2568-2575. ( DOI: 10.1039/C4RA12539H). Beless, B., Rifai, H.S.,Rodrigues, D.F. Efficacy of Carbonaceous Materials for Sorbing Polychlorinated Biphenyls from Aqueous Solution. 2014. ES&T. v.48 (17), p. 10372-10379. Fan, Jingjing, Onal, T.O. ; Rodrigues, D.F. The synergism of temperature, pH and growth phases on heavy metal biosorption by two environmental isolates. 2014. J. Hazardous materials.v. 279, p. 236-243. Mejías, I.E.C. ; Santelli, G.l; Sakata, S.; Filho, S.S.F. ; Rodrigues, D.F. Copper removal using a heavy-metal resistant microbial consortium in a fixed-bed reactor. 2014. Water Res. v. 62, p.156-166. Mejías, I.E.C. ; Mangadlao, J.D. ; Nguyen, H.; Advincula, R.C. ; Rodrigues, D. F. Non-human cytotoxic Graphene Oxide functionalized with ethylenediamine triacetic acid for Heavy Metal Adsorption and Anti-microbial applications. 2014. Carbon, V. 77, p. 289–301. doi:10.1016/j.carbon.2014.05.032. Musico, Y.L.F. ; Santos, C.M. ; Dalida, M.L. ; Rodrigues, D.F. Surface modification of membrane filters using graphene-based nanomaterials for bacterial inactivation and removal. 2014. ACS Sustain Chem Eng, v. 2 (7), p. 1559–1565. dx.doi.org/10.1021/sc500044p. Smith, S.C.; Ahmed, F.; Gutierrez, K.; Rodrigues, D.F. A Comparative Study of Protein Adsorption with Graphene, Graphene Oxide, and Single-Walled Carbon Nanotubes: Potential Environmental Applications. 2014. Chem. Eng. J. v. 240, p. 147-154. Onal, T.O. ; Rodrigues, D.F. Optimized carbonate micro-particle production by Sporosarcina pasteurii using response surface methodology . 2014. Ecol. Eng. J. V. 62, 168–174. Onal, T.O. ; Rodrigues, D.F. High Throughput Colorimetric Assay for Rapid Urease Activity Quantification. 2013.J. Microbiol. Methods. V.95 (3), 324–326. Ahmed, F.; Santos, C.M. ; Rodrigues, D.F. Implications of Graphene Oxide on wastewater microbial communities and wastewater treatment process performance. Journal of Hazardous Materials, 256– 257 (2013) 33– 39. Ahmed, F.; Santos, C.M. ; Mangadlao, J.; Advincula, R.; Rodrigues, D.F. Application of electroactive PVK-SWNT nanocomposite as effective antimicrobial coating material for membrane filter. 2013. Water Research, V. 47 (12), 3966–3975. Smith S.C., Rodrigues D.F. The Fate of Carbon-Based Nanomaterials in the Environment. J Bioremed Biodeg, 2013. 3:e129. doi:10.4172/2155-6199.1000e129. Musico, Y.L.F. ; Santos, C.M. ; Dalida, M.L. ; Rodrigues, D.F. Improved removal of lead(II) from water using a polymer-based graphene oxide nanocomposite. J Mat Chem A. 2013, 1 (11), 3789 - 3796 ( DOI: 10.1039/c3ta01616a). Rodrigues, D.F. ; Jaisi, D.; Elimelech, M., Toxicity of Functionalized Single-Walled Carbon Nanotubes on Soil Microbial Communities: Implications for Nutrient Cycling in Soil. Environmental Science & Technology. 2013 Jan 2;47(1):625-33 (DOI: http://dx.doi.org/10.1021/es304002q). Pangilinan, K.D. ; Santos, C.M. ; Estillore, N.C.; Rodrigues, D.F. ; Advincula, R.C. Temperature-Responsiveness and Antimicrobial Properties of CNT–PNIPAM Hybrid Brush Films. Macromol. Chem.Physic.2012 (DOI: 10.1002/macp.201200464). Santos, C.M. ; Mangadlao, J.; Leon, A.; Ahmed, F.; Advincula, R.C. ; Rodrigues, D.F.. Graphene nanocomposites for biomedical applications: Fabrication, Characterization, Antimicrobial and Cytotoxic investigations Nanotechnology 2012 Oct 5;23(39):395101. Mejías, C. I. E.; Wei, X.; Rodrigues, D.F., Toxicity of a polymer-graphene oxide composite against bacterial planktonic cells, biofilms, and mammalian cells. Nanoscale 2012. v.4, p.4746-4756. Ahmed, F.; Santos, C. M.; Vergara, R. A. M. V.; Tria, M. C. R.; Advincula, R. C.; Rodrigues, D. F., Antimicrobial applications of electroactive PVK-SWNT nanocomposites. Environmental Science & Technology 2012. v.46, p. 1804-1810. Santos, C. M.; Milagros Cui, K.; Ahmed, F.; Tria, M. C. R.; Vergara, R. A. M. V.; Leon, A. C.; Advincula, R. C.; Rodrigues, D. F., Bactericidal and Anticorrosion Properties in PVK/MWNT Nanocomposite Coatings on Stainless Steel. Macromolecular Materials and Engineering 2012. v. 297, 807-813. Santos, C. M.; Tria, M. C. R.; Vergara, R. A. M. V.; Ahmed, F.; Advincula, R. C.; Rodrigues, D. F., Antimicrobial graphene polymer (PVK-GO) nanocomposite films. Chemical Communications,2011. 47 (31), 8892 – 8894. 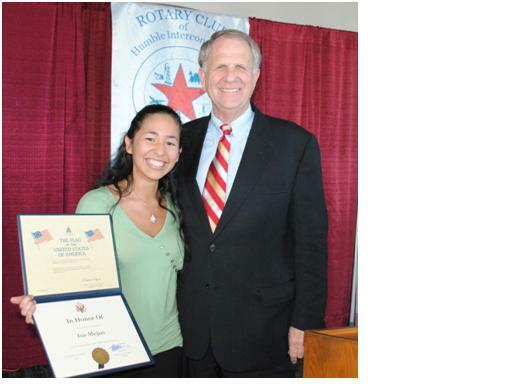 Rodrigues, D.F., Biofilters: A Solution for Heavy Metals Removal from Water. J Bioremed Biodegrad 2011, 2, e101. Vishnivetskaya, T. A.; Lucas, S.; Copeland, A.; Lapidus, A.; del Rio, T. G.; Dalin, E.; Tice, H.; Bruce, D. C.; Goodwin, L. A.; Pitluck, S., Saunders E, Brettin T, Detter C, Han C, Larimer F, Land ML, Hauser LJ, Kyrpides NC, Ovchinnikova G, Kathariou S, Ramaley RF, Rodrigues DF, Hendrix C, Richardson P, Tiedje JM. Complete genome sequence of the thermophilic bacterium Exiguobacterium sp. AT1b. Journal of bacteriology 2011, 193, (11), 2880-2881. Pernites, R. B.; Santos, C. M.; Maldonado, M.; Ponnapati, R. R.; Rodrigues, D. F.; Advincula, R. C., Tunable Protein and Bacterial Cell Adsorption on Colloidally Templated Superhydrophobic Polythiophene Films. Chemistry of Materials 2011. (in press DOI: 10.1021/cm2007044). Rodrigues, D. F.; Elimelech, M., Toxic effects of single-walled carbon nanotubes in the development of E. coli biofilm. Environmental Science & Technology 2010, 44, (12), 4583-4589. Ayala-del-Río, H. L.; Chain, P. S.; Grzymski, J. J.; Ponder, M. A.; Ivanova, N.; Bergholz, P. W.; Di Bartolo, G.; Hauser, L.; Land, M.; Bakermans, C.; Rodrigues, D.F. ; Klappenback, J.; Zarka, D.; Larimer, F.; Richardson, P.; Murray, A.; Thomashow, M.; Tiedje, J.M. The genome sequence of Psychrobacter arcticus 273-4, a psychroactive Siberian permafrost bacterium, reveals mechanisms for adaptation to low-temperature growth. Applied and environmental microbiology 2010, 76, (7), 2304-2312. Rodrigues, D. F.; Elimelech, M., Role of type 1 fimbriae and mannose in the development of Escherichia coli K12 biofilm: from initial cell adhesion to biofilm formation. Biofouling 2009, 25, (5), 401-411. Rodrigues, D. F.; da C Jesus, E.; Ayala-del-Río, H. L.; Pellizari, V. H.; Gilichinsky, D.; Sepulveda-Torres, L.; Tiedje, J. M., Biogeography of two cold-adapted genera: Psychrobacter and Exiguobacterium. The ISME journal 2009, 3, (6), 658-665. Rodrigues, D.F. ; Sakata, S.; Comasseto, J.; Bícego, M.; Pellizari, V., Diversity of hydrocarbon‐degrading Klebsiella strains isolated from hydrocarbon‐contaminated estuaries. Journal of applied microbiology 2009, 106, (4), 1304-1314. Rodrigues, D. F.; Tiedje, J. M., Coping with our cold planet. Applied and environmental microbiology 2008, 74, (6), 1677-1686. Rodrigues, D.F. ; Ivanova, N.; He, Z.; Huebner, M.; Zhou, J.; Tiedje, J., Architecture of thermal adaptation in an Exiguobacterium sibiricum strain isolated from 3 million year old permafrost: a genome and transcriptome approach. 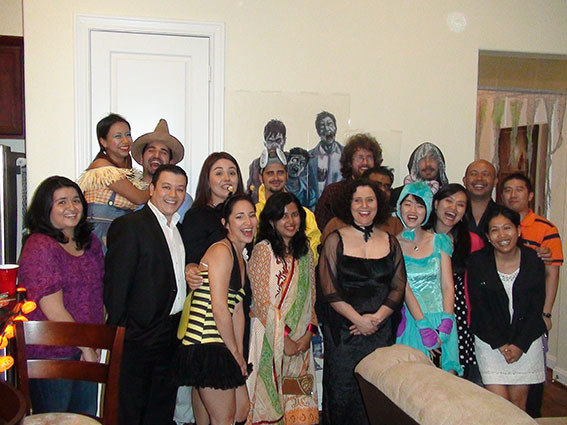 BMC genomics 2008, 9, (1), 547. Kang, S.; Herzberg, M.; Rodrigues, D. F.; Elimelech, M., Antibacterial effects of carbon nanotubes: size does matter! Langmuir 2008, 24, (13), 6409-6413. Rodrigues, D. F.; Tiedje, J. M., Multi‐locus real‐time PCR for quantitation of bacteria in the environment reveals Exiguobacterium to be prevalent in permafrost. FEMS microbiology ecology 2007, 59, (2), 489-499. Rodrigues, D. F.; Goris, J.; Vishnivetskaya, T.; Gilichinsky, D.; Thomashow, M. F.; Tiedje, J. M., Characterization of Exiguobacterium isolates from the Siberian permafrost. Description of Exiguobacterium sibiricum sp. nov. Extremophiles 2006, 10, (4), 285-294. Andrade, L. H.; Comasseto, J. V.; Rodrigues, D. F.; Pellizari, V. H.; Porto, A. L. M., Enantioselective reduction of ortho-substituted-acetophenones by bacterial strains isolated from medium enriched with biphenyl or diesel fuel. Journal of Molecular Catalysis B: Enzymatic 2005, 33, (3), 73-79. Sakata, S. K.; Taniguchi, S.; Rodrigues, D. F.; Urano, M. E.; Wandermüren, M. N.; Pellizari, V. H.; Comasseto, J. V., Development of a static headspace gas chromatographic/mass spectrometric method to analyze the level of volatile contaminants biodegradation. Journal of Chromatography A 2004, 1048, (1), 67-71. Bakermans, C., P. W. Bergholz, D. F. Rodrigues, T. A. Vishnivetskaya, H. L. Ayala-del-Rio, and J. M. Tiedje. 2012. Genomic and expression analyses of cold-adapted microorganisms. In L. G. Whyte and B. Miller (ed. ), Polar Microbiology. ASM Press, Washington, DC. Santos, C.M. ; Tria, M.C.R. ; Foster, E.; Advincula, R.C. ; Rodrigues, D.F. Carbon-based polymer nanocomposites: From preparation to antimicrobial applications. In: Munoz-Bonilla, A.; Cerrada, M.L. ; Fernandez-Garcia M., 2014, Polymeric Materials with antimicrobial activity: From synthesis to applications. Published by the Royal Society of Chemistry. ISBN: 9781849738071. Nadres, E.T. ; Fan, J.; Rodrigues, D.F. Toxicity and Environmental Applications of Graphene-based Nanomaterials. In: Gonçalves, G.; V., Mercedes; Marques T; 2016. The new paradigm of graphene-based materials in medicine and environment. Published by Springer- International Publisher. 4)	Ad Hoc Reviewer for Scholarly Journal: Environmental Science and Technology, Applied and Environmental Microbiology, FEMS Microbiology Letter, FEMS Microbiology Ecology, Journal of Biotechnology, Antarctic Science, Current Microbiology, Journal of Basic Microbiology, Global Research Journal of Microbiology, Biofouling, Extremophiles, Open Forensic Science Journal, Journal of Environmental Informatics, RSC Advances, Soft Matter, Colloids and Surfaces B: Biointerfaces, Analytical Methods, Journal of Zhejiang University Science B, International Journal of Ambient Energy, nanoscale, Langmuir, Toxicology Research, ACS nano, Journal of Materials Chemistry, Analyst, Journal of Hazardous materials, Carbon, Analytical Chemistry, Water Research, ACS Applied Materials & Interfaces, Chemical Engineering Journal, Science of the Total Environment, polymers, metallomics, Applied Microbiology and Biotechnology, International Biodeterioration & Biodegradation, Environmental Science and Pollution Research, chemosphere, BMC Genomics, Bioresource Technology, Water, Air, & Soil Pollution, Analytical Methods, Environmental Engineering Science, Water Environment Research, Environmental Chemistry Letters, ES&T Letters, PLOS ONE, Applied Surface Science, Ecological Engineering, ACS Sustainable Chemistry & Engineering, Industrial & Engineering Chemistry Research, Ecotoxicology and Environmental Safety, Journal of Microbiological Methods, Materials Research Bulletin. Served in the NSF, NASA and NIHEHS review panels, Antarctica New Zealand Program, the Chinese Research Fund for the Control of Infectious Diseases/Health and Health Services Research Fund, Proposal reviewer for the Maryland Industrial Partnerships Program at the University of Maryland, and United States- Israel Binational Science Foundation, China-Israel Cooperative Scientific Research program, COST Swiss program from the State Secretariat for Education Research and Innovation SERI.